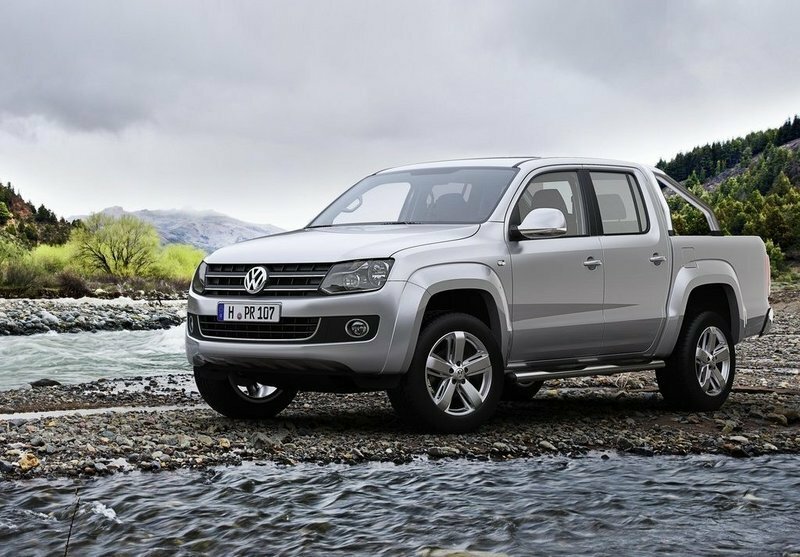 The Amarok is the newest pickup in Volkswagen’s lineup of commercial vehicles and was launched in 2011. The vehicle was designed for South America, Europe and New Zeeland markets and will compete with models like the Toyota Hilux. The Volkswagen Amarok features a modern exterior design combined with a top notch build quality and the overall refinement typical for the German manufacturer. The vehicle also comes with the latest Volkswagen technologies engineered for commercial purposes and it’s fitted with a six speed gearbox, low range transfer box, permanent four wheel drive, locking centre and rear differentials. Under the hood it gets two capable diesels units with a displacement of 2.0 liters. The Volkswagen Amarok’s front fascia has without a doubt one of the best looking designs found on today’s pickups. The front is dominated by a modern interpretation of Volkswagen’s grille which is traversed by two thin bars that have received a tasty chromed treatment. The light clusters come with integrated turning signals and have a crisp and modern design which gives the vehicle a futuristic appearance. The wraparound bumper shares the same modern design with the rest of the body and comes with rounded edges and a big central air intake. 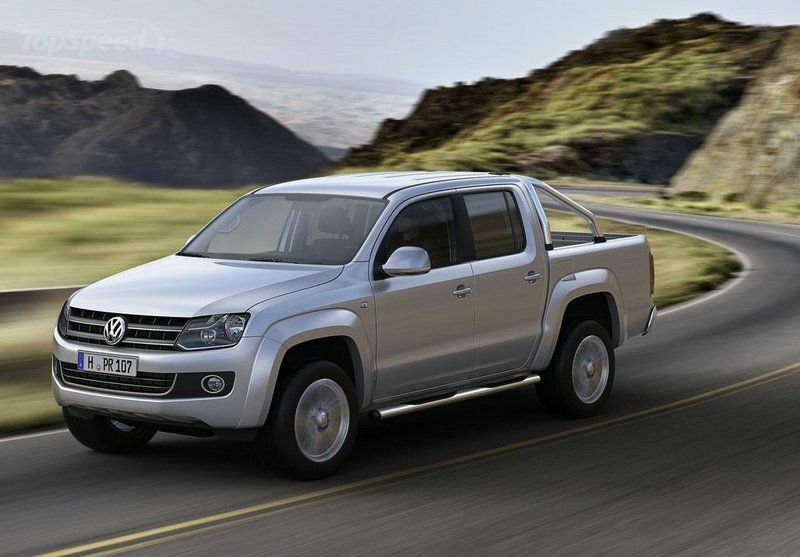 The bumper is also equipped with a pair of round fog lamps which complete the modern look of the Amarok. Overall the vehicle features the same aggressive style which is common in this segment. The purposeful look of the truck is enhanced by the high ground clearance and the massive wheel arches. The truck bed of the Volkswagen Amarok Double Cab has the largest dimensions in this class measuring 1,555 millimetres long, 1,620 millimetres wide and offering a load volume of up to 2.52 square meters. Thanks to its generous load dimensions, the Volkswagen Amarok can be loaded with Euro pallets placed sideways - which is a unique feature found in this segment- thus saving more space for additional cargo. The vehicle has a payload capacity of up to 1.15 metric tons and can pull a trailer with a maximum load of 2.8 metric tons. Access inside will prove to be a bit difficult, as the Amarok sits pretty high from the ground. There are however a few roof-mounted grab rails to help you on the way up. 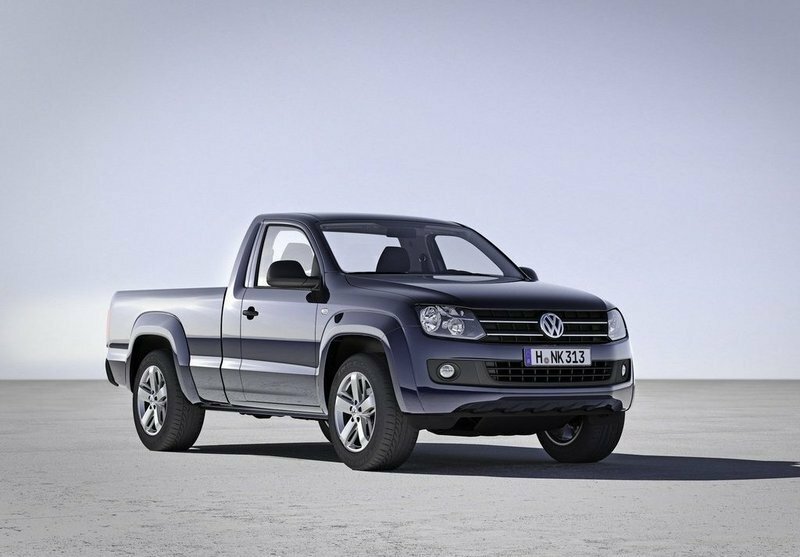 For the start the Volkswagen Amarok is offered only with a crew cab configuration with a single cab version waiting to be launched in the near future. Inside you’ll be welcomed by a fairly pleasant environment which is usually typical for all vehicles built by Volkswagen. Needless to say that everything inside looks upmarket, while the overall design is modern yet simple. The Amarok was build especially for tough jobs so the materials used inside were choose to last, being mostly hard textured plastics without any soft touchpoints. 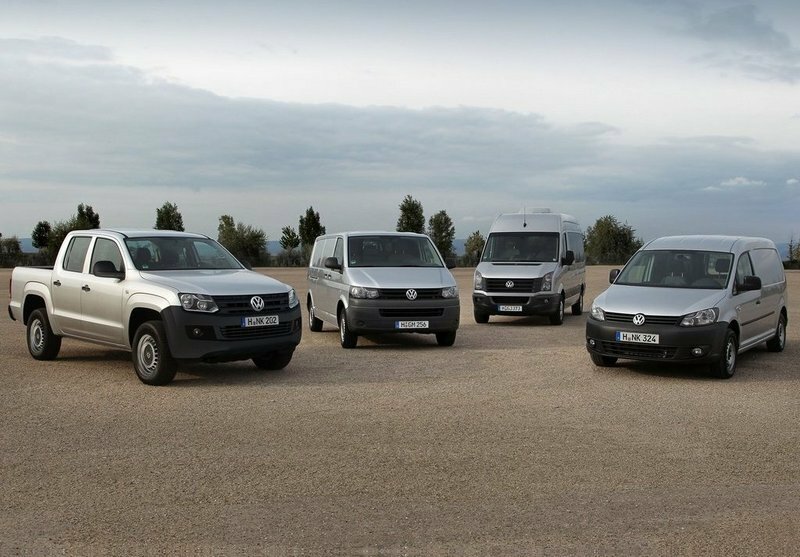 However, the build quality remains typically Volkswagen, which means that every fitting received maximum attention from the company’s engineers and the cab seems ready to last just a little bit more than forever. Space if far from being a problem and four people can travel in full comfort with decent head, shoulder and leg-room for everyone. You are surrounded by a generous glass area, so outward visibility is part of the high class, as well. One you’ll hop into the driver’s seat you’ll notice that you seat higher than usual, which gives you a commanding view of the road. You won’t need to worry about comfort, as there are plenty adjustments to help you find your favorite driving position without problems. There are also plenty of cubby holes and consoles to keep your things safely and the door pockets have a decent size. Moreover, there is also a large central storage bin to hide items from curious eyes. The vehicle was launched with a bi turbo 2.0 liter TDI common rail direct injection engine. The engine churns out 163 hp with a peak torque of 400 Nm achieved from as low as 1500 rpm. This engine offers adequate performances and copes great with both city and highway traffic being more refined than what you’ll usually find in this segment. The engine offers a very low fuel consumption which is rated at only 7.6 liters/100 km for the 4x2 version. The second unit it’s a 122 hp four cylinder TDI which is fitted with a variable-geometry turbocharger. Despite its relatively small power the engine is able to develop a maximum torque of 340 Nm from 2000 rpms. Thanks to its generous torque the engine can deal pretty well with massive loads and has a fuel consumption of just 7.5 liters/100 km. The turbo-diesel direct-injection engines also fulfil the Euro-5 emissions standard and both of them are fitted with a standard six speed transmission. 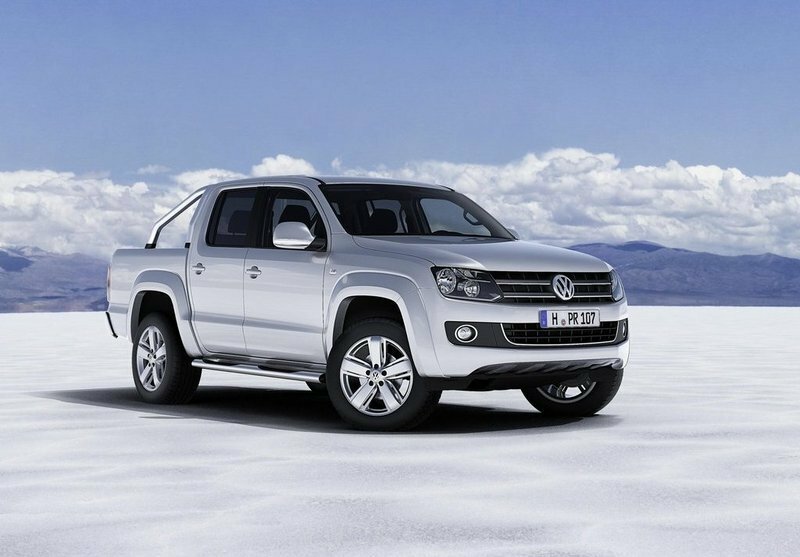 The Volkswagen Amarok is offered with a choice of three different drivelines including permanent all-wheel drive, selectable four-wheel drive and rear-wheel drive (4x2) models. The Volkswagen Amarok 4MOTION with selectable four-wheel drive feels great on any type of terrain and it’s a good off-road performer. The ride quality is assured by the progressively tuned Heavy Duty spring package with three main and two auxiliary spring packs. All drivelines also have an electronic differential lock that utilizes automatic braking intervention, designed to improve traction on all types of road surfaces. While you won’t have any complains about the off road performances, the on road drive is far from being a pleasant experience, as the Amarok’s heft and size won’t work in its advantage limiting its agility. There is also a pretty big body roll in bends and the ride feels unbalanced. The Volkswagen Amarok is a strong arrival in the pickup segment, so Nissan, Mitsubishi and Toyota have all reasons to feel threatened by the new comer. The vehicle has a modern exterior design and also offers the biggest load bed in the segment which makes it slightly more practical than its competitors. The cabin is top notch with an excellent build quality and the typical Volkswagen refinement. The engines are capable of dealing with heavy payloads and they are also fairly efficient. You won’t have any complains about the off road abilities either, but on paved roads The Volkswagen Amarok won’t be as agile as other vehicles in its class.